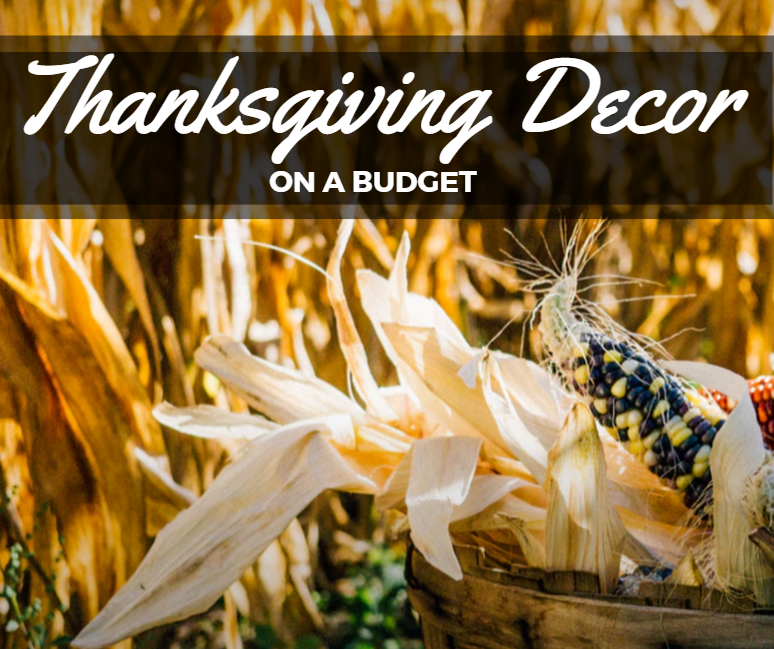 If you haven’t decorated for your big Thanksgiving dinner yet, don’t stress out! You still have plenty of time and you don’t have to spend a ton of money. 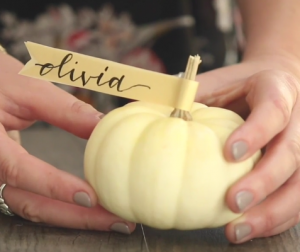 Here are some pretty simple and inexpensive ways to decorate before next Thursday. 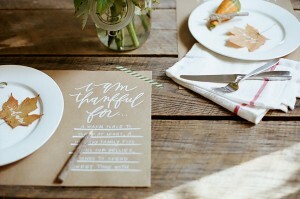 Give each guest a placemat and a pen for them to write down what they’re thankful. Not only is this placemat so cute, but it’s thoughtful. Have everyone go around and share what they wrote. Bonus: it’ll give the kids something to draw on. The instructions for this DIY call for you to bleach the pinecones. You can skip that step and go straight to tying them if you prefer. 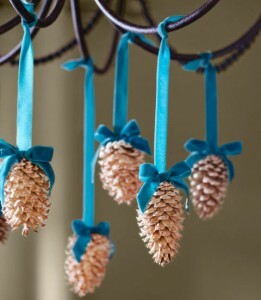 Hang the pinecones on your chandelier or in a bunch on your front door for an alternative to a wreath. Paint some pumpkins or pick up some that are already white. 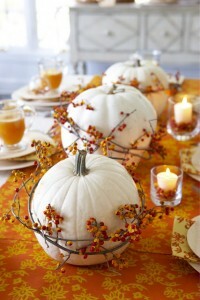 Get some bendable foliage from some craft store and wrap it around a few pumpkins going down the center table. It’s possibly the easiest centerpiece and it will wow your guests. Nothing says Fall like wheat. 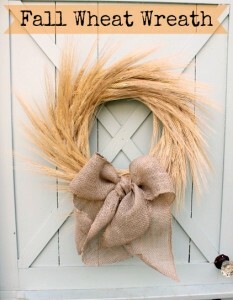 For this DIY all you need are three supplies: a straw wreath, wheat and a ribbon. Hang it on your front door and it’ll welcome in Thanksgiving. Grab a book from the thrift store and let your kids help you pick out some pretty fall leaves. They can even help you cut out the pennants. 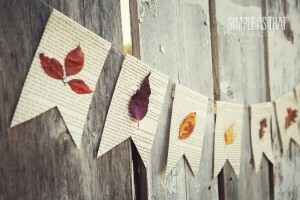 String it all together and you have a banner for your mantle, wall or staircase. 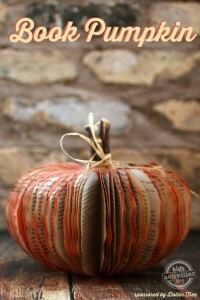 Here’s another book craft for you. Grab some extra books at the thrift store when you do the craft above. You can use it as a centerpiece this year and for years to come. The video link above goes to three different chic place setting ideas that are pretty simple (if you have good handwriting). If your handwriting doesn’t look like it just hopped off an encouraging artsy poster, print the names out for the projects with whatever font you want. 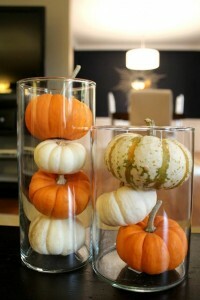 Add instant color to your table by stacking some mini pumpkins in a glass. You can grab these vases at Hobby Lobby (don’t forget your 40% off mobile coupon). 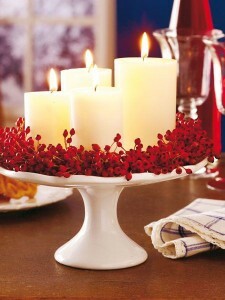 Grab a few pillar candles, a cake stand, and some fall foliage from hobby lobby. Arrange the foliage around the candles and you have a beautiful centerpiece. If you have an elevated cake stand, it frees up room on the table for all of the yummy dishes to fit underneath it. 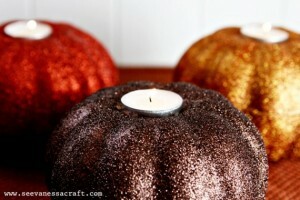 If you’re looking for some more glamorous decorations, glitter a pumpkin! Cut out a hole in the top of the pumpkin with a drill. This will be a spot for the candle to go. Then, cover the entire pumpkin in glitter.